2003 pretty much marked the end of this the 10th generation of F-Series trucks. I say pretty much because this (F-150) body style continued in 2004 as the F150 Heritage model. That allowed Ford switch over assembly plants from the old to the new body style at different times. 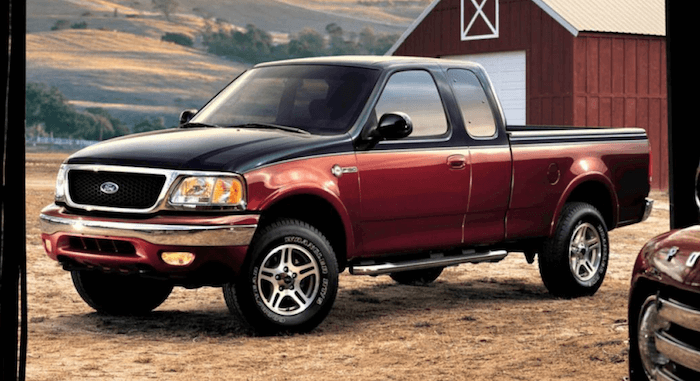 There are a lot of small changes to mention for '03, however the big F-Series news in 2003 was the release of all-new 2004 F-150 (which was available for purchase in early 2003). This year also marked 25 years of truck sales leadership. 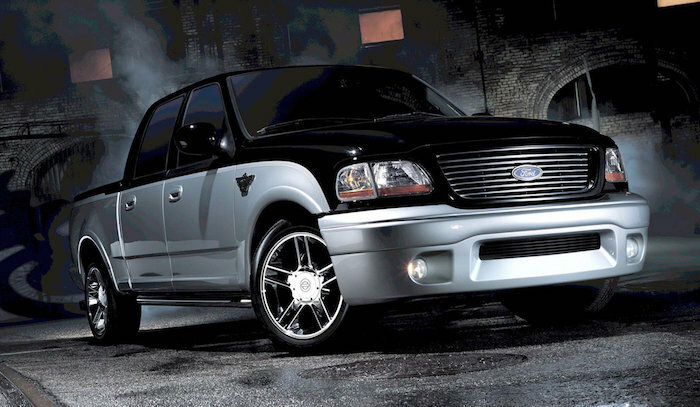 The 1997-2003 F-150 generation saw so many changes and additions. You could say that this generation was a bit of a turning point for Ford Trucks. The trucks were more car-like and trucks were really becoming a vehicle used for personal driving as well as work and play. 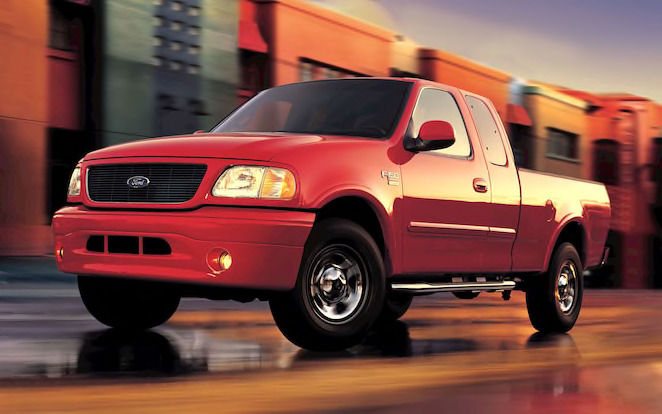 We saw the introduction of the NASCAR edition truck in 1998, the Harley-Davidson edition trucks, the new King Ranch, the return of the SVT Lightning, the full 4-door SuperCrew introduction, and so much more. The new STX option package comes with a Kenwood CD/MP3 player, black billet-style grille with chrome surround and 17" chrome steel wheels. It also has body color bumpers, mirror caps, wheel moldings and front valance. STX also includes chrome tubular cab steps, fog lamps and STX decals. The 2003 F-150 was assembled in Kansas City Missouri, Norfolk Virginia, and Oakville Ontario. 2003 marked 100 years of Ford Motor Company. Ford celebrated by producing unique Centennial vehicles such as the Taurus and F-150. 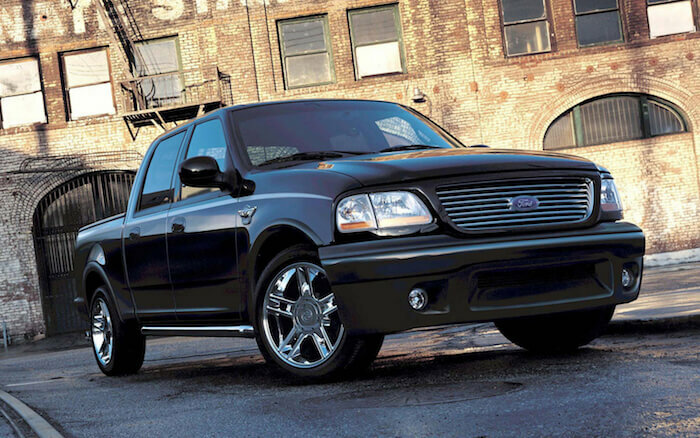 The special anniversary F-150 was doubly special, because 2003 was also Harley-Davidson's 100th anniversary. As such, the 2003 Harley F150 was very special. So, Ford had a 100th anniversary Heritage Edition F-150 and also a 100th anniversary Harley edition F-150. Fun fact: The Heritage Edition F-150 option package was called Heritage Limited Edition in the Canadian F-150 brochure. Trim levels for 2003 officially were XL, XLT, and Lariat. The FX4, Heritage Edition, STX, and King Ranch trucks were all option packages. In later years some of these would become their own trim levels. FX4 can be added to XLT and Lariat. Heritage Edition can be added only on XLT. STX can only be added to XL and XLT trims. And finally, King Ranch can only be added to a Lariat trim level. In addition there are the Work Truck group, XL Sport group, and XLT Sport group. Those trims and option packages are all part of the regular F-150 lineup and brochure. Outside of that there was the Harley F-150 and the SVT Lightning that we mentioned already. The available engines and transmissions were the same as 2002. Anecdotally the 2003 F-150 had a lot of the "bugs" worked out that affected earlier trucks from this generation. For example, the issue where spark plugs would blow out of the head due to the actual head not having sufficient threads to hold the plug in was corrected sometime in 2002. I believe the well-publicized cruise control recall that caused trucks to start on fire when even parked was still affecting Ford trucks in '03. There was the issue of gas tank straps rusting out causing fuel tanks to drop to the ground, there was a recall for that issue that I can recall off the top of my head. As these engines aged, some of the somewhat common problems include leaking head gaskets, engine misfires (a lot of time it's due to failed coils), and no-start conditions. With that said, the 97-03 2 valve V8 engines proved to be more reliable than the newer 3 valve V8 engines. The newer engines, for example had a few major problems that were pretty common. The first is that the spark plugs get stuck in the engine when you try to change them. The problem was caused because ford used a 2-piece design for the plug, so it would break into two upon removal, causing large repair bills for owners. Also, the variable valve timing solenoids fail which cause driveability issues and engine noise. If you don't mind an older truck and reliability is important to you, the 97-03 F-150s should be on your list. As these trucks age rust is an issue. The rocker panels (the metal part under the doors) rusts out, that is a very common thing. The front bottom corners and rear bottom corners of the box rust out pretty commonly too. The SuperCrew box is fiberglass on the outside so it will never rust. Personally I see many of these trucks on the road daily and the rockers are the first thing to rust. I do see some cab corners rusting out too. The door bottoms actually rust out too because water gets trapped and they rust from the inside. The good news though is that the rust is first apparent when you open the door, it takes quite a while to penetrate out to the outside, so if you catch it before it's too late, it's not too hard to fix. Quick tip: If you own any F-150 prior to 2015 and you live where trucks get rusty, be sure to spray the *back* sides of panels, *inside* the doors and rocker panels, cab corners, etc. 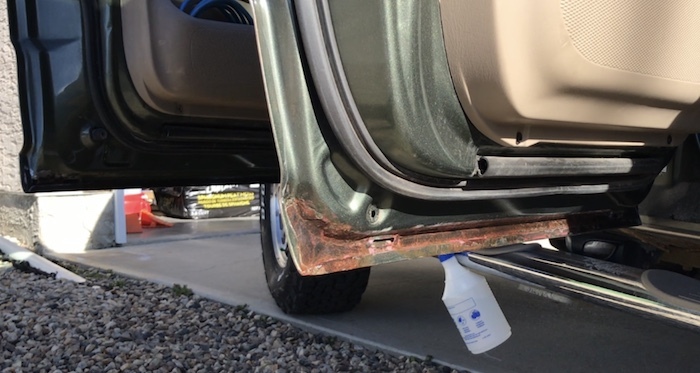 to prevent rust from forming or spreading. Much of the time the rust starts from behind, so by the time you see it on the outside, it's three times worse on the back. In this case, I ground down the rust as much as possible, used a rust dissolver gel (naval jelly), and then primed, painted and clearcoated. Once that was dry, I sprayed Fluid Film inside the door panels to prevent any future rust. Even though my truck is rusting out in some spots, I still enjoy owning and driving it. Properly maintained, these trucks last hundreds upon hundreds of miles. I'm not saying Fords rust any worse than any other pickups. The Heritage package F-150 had a unique two-tone paint scheme exclusive to only it. The color choices for it were Arizona Beige Metallic, Burgundy Red Metallic, and Dark Shadow Grey Metallic.